Hedley Construction & Development Inc. is a full service commercial construction company founded by George Hedley in 1977. 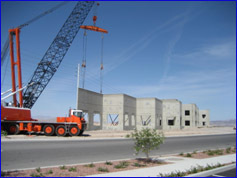 With over 30 years of experience building over 15,000,000 square feet of commercial, industrial, office, retail, medical, self storage, hotel, restaurant, commercial tenant improvements, laboratory, custom homes, and multi-family projects throughout Southern California and the greater Las Vegas area.. Our multi-faceted expertise combined with our development, pre-construction, and construction systems, standards, and services will make your project goals become a reality. Our Goal Is To Make Your Project A Success! As a general contractor, HEDLEY constructs hundreds of projects ranging from $3,000,000 to $10,000,000 each for its loyal construction clients. As a developer, HEDLEY has participated in the ownership, development, acquisition, planning, design, construction, and management of over 1,500,000 square feet of commercial, industrial and office projects ranging from $5,000,000 to $25,000,000 in total value. We pride ourselves in meeting our client’s goals in the areas of schedule, cost, and quality. Who Demand Trust, Integrity, Expertise, Full Value & Total Service!